Granola with blueberries and powdered milk. A high protein meal for energy and it tastes great. Mountain House - Pack light. Eat right. With our easy-to-prepare stand up, zipper pouch, it's never been easier to make a great tasting meal! Simply open, pour in boiling water, and zip. Then eat right out of the pouch. Granola with blueberries and powdered milk. A high protein meal for energy and it tastes great. Mountain House - Pack light. Eat right. With our easy-to-prepare stand up, zipper pouch, it&apos;s never been easier to make a great tasting meal! Simply open, pour in boiling water, and zip. Then eat right out of the pouch. Our pouches have a shelf life of at least 7 years from the date of manufacture as long as the pouch is stored unopened in a cool area. 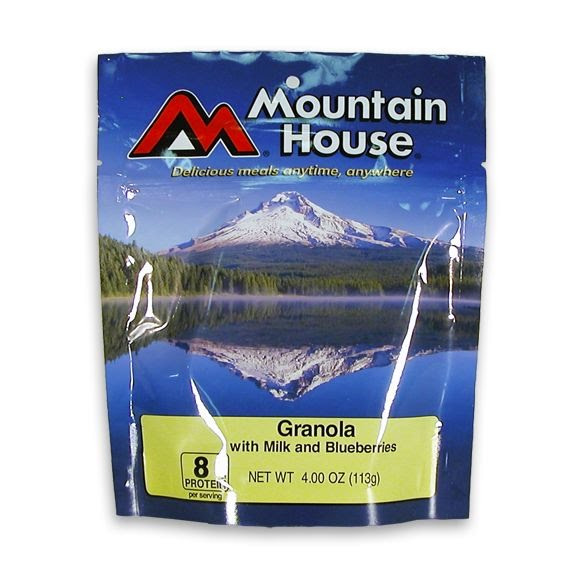 INGREDIENTS: Granola (rolled oats, brown sugar, unsweetened coconut, soy oil, sesame seed, wheat germ, natural vanilla flavoring), Nonfat Dry Milk, Freeze Dried Blueberries, Dry Cream (sweet cream, lecithin, and tocopherols), and Natural and Artificial Vanilla Flavor. Contains: Soy, Milk, Wheat, Coconut.